So, obvs, I’m not great at naming finished objects. Fabric/Designer + Pattern = Long Obnoxious Name Meaningless to Anyone Who Doesn’t Sew. Maybe this pillow does deserve a better name? Because while it started as an exercise, an idea I wanted to try out, it turned out really pretty cute. It has exactly the kind of worn old vintage-y (kind of crappy homemade, even) look that I really, really love. I put it on my green Ikea chair with my white knitted throw (a gift! I wish I could take credit) and I love it there. It’ll probably never move. I’m cranking through a PILE of scrap right now, trying to sort and start a couple of low-volume scrap quilts for wedding gifts. Low-volume seems sort of bridal to me, for some reason. I also dug through my stash and pulled everything that was remotely low-volume. I realized that Denyse Schmidt (isn’t she practically perfect in every way?) is a dab hand at low-volume prints with lots of movement and interest. So I cut: my brand-new Shelburne Falls, my Flea Market Fancy Legacy, my Chicopee. I had a low-volume print from Joann’s that I love (that lime green flower-navy blue nut print in the bottom row of the above picture), and, as luck would have it, Pink Castle sent a Greenfield Hill print in their February blue Stash Stack. (It’s the light blue hash-mark print.) I itched for teeny tiny low-volume HSTs. There are 144 of them in this pillow top; I started with 2.5” squares. 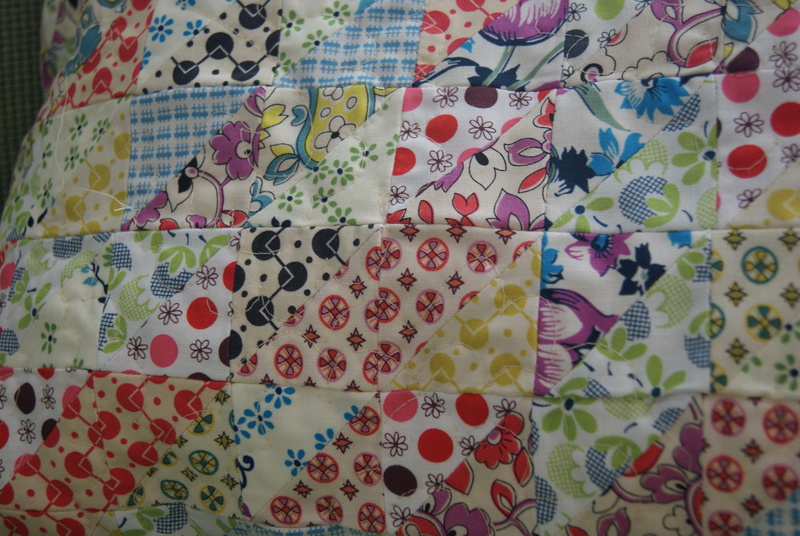 144 HSTs, five beloved Denyse Schmidt fabric lines, one pillow top. 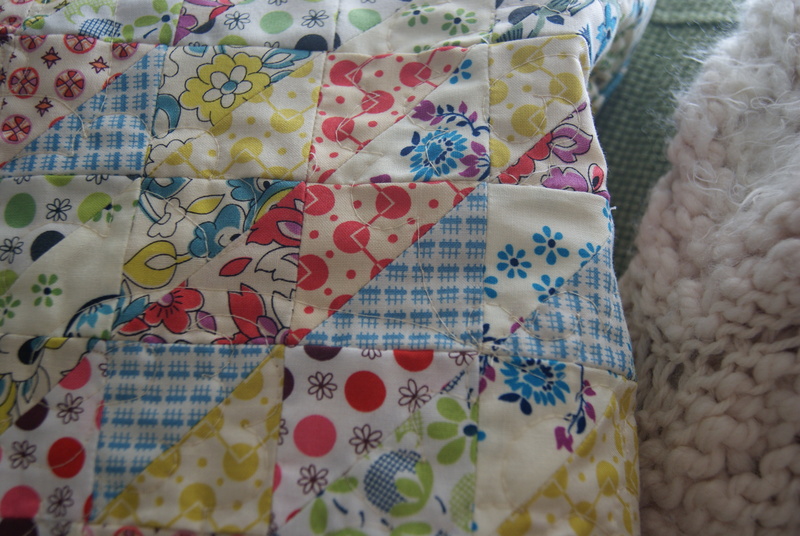 I am still practicing my FMQ, and chose Angela Walters’ flower pattern to quilt this pillow top. My husband was impressed with my practice swatch, so I promise, if you could see the quilting, I wouldn’t be all that embarrassed. But this pillow is decidedly not about the quilting. 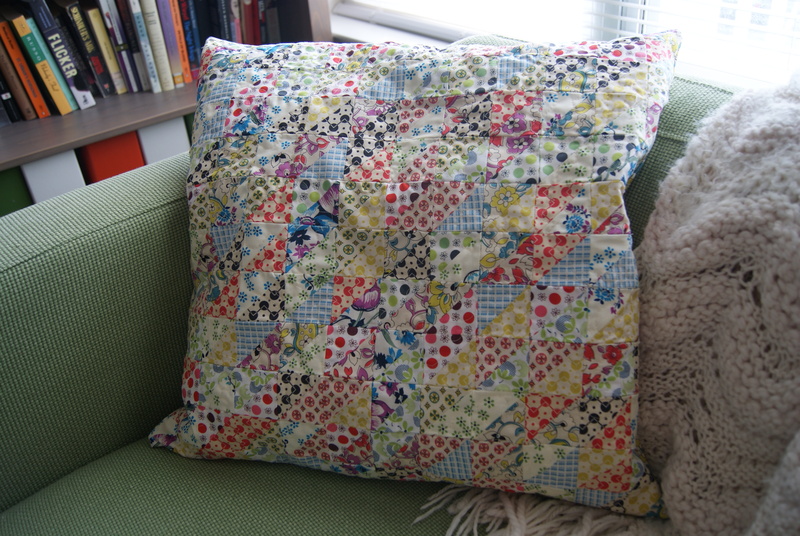 This isn’t the coolest, sharpest, or best-sewn pillow I’ve ever made. It is perhaps the scrappiest, the most vintage, the most hand-made-looking. It’s made of a stash of fabrics I love and have held on to for too long–and some brand-new fabrics I’m glad I had a reason to buy! I really like this! And I think that light blue fabric really adds something neat to the mix! It looks perfectly squishy. Call it “Dotty for DS” pillow? I like Marla’s name suggestion, too! Maybe even Dotty for Denyse, too? I like the look of all these prints together. You are right, low volume does seem kind of bridal, never thought of that before. Great use of her fabric!